Provence stands as Southern France’s glorious gateway to the viticultural and gastronomic treasures awaiting discovery along the Rhône River Valley. A river cruise from Provence to Burgundy is likely one of the best ways to experience these famous wine regions and cruising is the most leisurely and convenient way to uncover abundant appellations and epicurean adventures. Of course, one of the attractions of seeing the countryside by boat is that you only unpack once and this simply eliminates the worry of transportation and lodging, granting more time to create memories of fabulous food, and wonderful wine discovered in historic villages in the company of new-found friends. Rising from the azure blue Mediterranean waters, the hillsides of Provence are awash in a purple haze of lavender richness that merges with a vibrant palate of colors softened daily by the setting sun’s rose accents. The colors of the countryside have attracted artists for centuries. To painters such as Paul Cezanne and Vincent Van Gough, the light and hillside hues of Provence provided a unique translucent quality that captured their imagination and led to some of their finest works. It’s easy to see why so many people who come to this region can’t resist the urge to stay. While the wines of Provence could be considered as highly under-rated, there are some great varietals grown here that can be very pleasing (about 36 varieties are permitted in the region’s wines). But it’s not just the grapes that make this a great area for wine value. The climate here is the definitive Mediterranean environment with abundant sunshine, little rain and cool evenings derived from the shade of the hillsides and valleys where the best vineyards lie. Perhaps exposure to the famous Mistral winds that blow heavily from the north occasionally make a solid contribution to local viticulture. These breezes serve to blow away pests, cool the vines and prevent mildew and other plant diseases that are often found where the air is mostly undisturbed. When a Mistral blows, it can be fierce. Strong enough to bend the trees southward along its path. But when winds diminish and benignly sweep across the lavender in the mountains, they carry a heavenly scent throughout the countryside. Lavender, true lavender and not the more common Lavandin, is quite rare and so was given its own AOC in 1981 to ensure the highest quality standards are met for this prized component of fragrances and foods. Only fields of Lavandula angustifolia within a specific territory, above 800 meters altitude, are classified as Haute-Provence Lavender AOC. This multi-purpose herb can be expensive but, unlike its more common counterpart, a little goes a long way. It is used in the well-known Herbes du Provence mixture where lavender is combined with savory, marjoram, rosemary, thyme and oregano. The mélange is a staple of French cooking and ubiquitous in the kitchens of chefs around the globe. Beyond adding an accent to this famous blend, it shines on its own as a key flavor constituent. 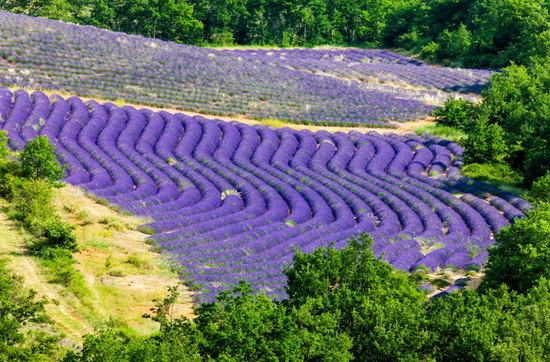 If you’ve never feasted upon delectable lavender cakes and savory sauces steeped in the purple flower, you need to find your way to Provence and enjoy some local delicacies fashioned from its signature flower. Of course, Côtes du Provence is well known as the benchmark for rosé wines. Approximately 90% of the production is pink but don’t let this virtual homogeneity fool you. The distinct terroir of the four sub-regions, along with the types of grapes grown in these areas and winemaking differences, contribute to the seemingly never-ending array of flavor and subtle color shifts found throughout the appellation. There is nothing like a refreshing rosé chilled to perfection to accompany a sunset cruise through the wildlife sanctuary of Camargue near Arles (especially when followed by a well-textured red from Bandols with a bit of dark chocolate). 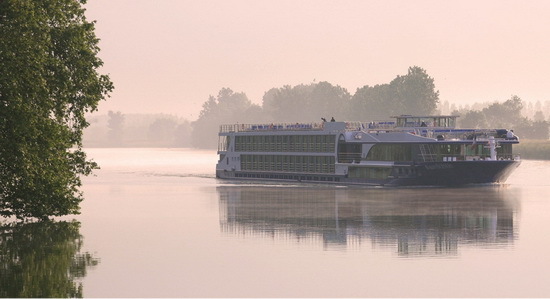 Leaving Arles northward on the Rhône River, the MS Avalon Scenery slowly wends its way towards Avignon as passengers prepare for the first of many delectable dinners on board. The evening repast is always preceded by the cruise director’s quick presentation of what to expect at the next port of call. The information session is normally accompanied by a taste of either the special cocktail of the day or perhaps a local bubbly. Each wine region produces at least some sparklers made using the traditional method of secondary fermentation in bottle. Many of these, other than Cremant de Bourgogne, aren’t available elsewhere, so why not sample a local offering to whet your appetite? Making early contact with the Maître D’ is critical to maximizing your food and wine experience. Ask for the wine list to start. The Avalon has a solid selection and there are complimentary wines chosen for each dinner. However, the ship is not averse to allowing purchased wines on board (unlike many larger ships). With the small corkage fee in mind, it is worth the trip to a wine shop early in the voyage to select a series of higher end wines from each of the regions along the route. Given the much lower prices locally than in foreign markets this strategy is very affordable. For example, a Guigal Côtes Rotie, Brun et Blond, sold for about $40 compared with a Canadian domestic price of about $70. In addition to some very affordable Châteauneuf-du-Pape, Rhône and Burgundian libations, it’s well worth the experience to buy some very inexpensive regional offerings. A Côtes du Rhône blend sells for less than $5 and at that price if it disappoints, there is no regret but it’s more likely to be quite a pleasant bargain. The first stop on the way towards Paris is Avignon. This city became famous during the 14th century when Pope Clement V decided to move the papal residence from Rome. While it remained as the palatial home of the papacy until Pope Gregory XI returned the seat of the church to Rome, the medieval ramparts and stone castle remain largely intact today. The castle is impressive not only due to its size and preservation, but it is almost entirely open to visitors, unlike many other European historic sites where only small parts are open for tours. Set in the expansive Place du Palais square, the gigantic stone edifice sits under the watchful eye of the gilded Virgin Mary atop the Notre Dame des Doms cathedral where there are over 250 religious historical artifacts housed. 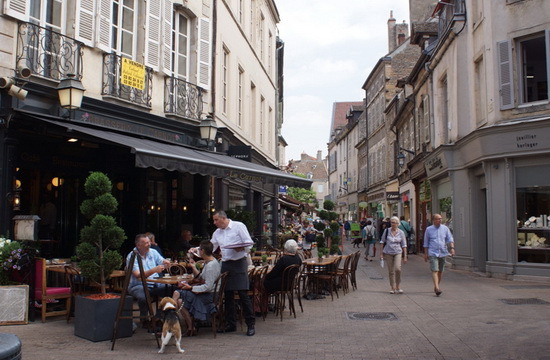 Avignon is a very walkable city and is replete with a wide selection of shops and restaurants. In Avignon, there are a number of great wine shops in addition to the Halles market, where a cornucopia of delicacies are available to dine upon or take away. This is the time to stock up on accompaniments to the sumptuous dinners on aboard. A good place to taste and buy near the heart of town is “Le Vin Devant Soi” (www.levindevantsoi.fr) where they offer 32 wines by the glass for tasting. Their selection is excellent, making this a one-stop destination for wine lovers. 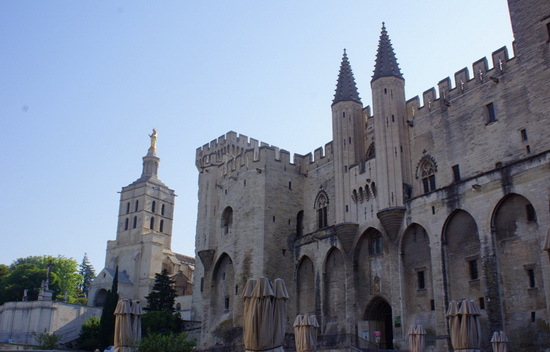 Although wines from the region are plentiful in Avignon, it may behoove the aficionado to hold buying any Châteauneuf-du-Pape in abeyance. After all, the namesake village is only about 10 miles north of the city and here the wine makers collaborate to make all their bottlings available through a series of small shops. The tiny village of Châteauneuf-du-Pape is quaint and quiet where seemingly all streets converge in the town square. Sitting under the hilltop ruins of the old summer palace built by Pope John XXII there are at least a dozen places to taste and buy. Not surprisingly, there is only one wine sold here but given the very generous AOC laws governing this region, no two winemakers produce the same blend. With 13 different varietals allowed in these wines, the mathematical combinations seem endless. The only rule is that the primary grape must be Grenache in red wines (there are some nice whites here but 95% of the production is red and no rosé is permitted). The alluvial soil in the hills surrounding Châteauneuf-du-Pape is covered with large stones known as “galets”. These remnants of the Rhône’s passage through the valley are perfect for reflecting the sunlight and for holding heat in through the cool evenings. Although seemingly hostile, these conditions have a great affinity for growing structurally sound vines and it would seem that the Grenache grape loves their rocky surroundings the most. Largely planted as bush vines, the thick-stemmed old growth vines of the region resembles the plantings of ancient Zinfandel in Paso Robles California. Travelling along the Rhône, shipboard life is leisurely and the scenery is pastoral with grazing lands for sheep and Charolaise cattle interspersed among the hillside vineyards. The countryside views are occasionally interrupted by the intervention of impressively deep locks required to move vessels up the river toward its mountainous origins. Some of the 12 different locks between Lyon and the Mediterranean can be as deep as about 20 meters so entering these cavernous marvels of engineering is a somewhat claustrophobic experience, albeit fleeting until the boat resumes its course. Heading north on the Rhône, the river starts to meander and at a particularly sharp bend lies Tain L’Hermitage where Syrah grapevines cling to the steep granite hillside rising from the shore. Some say this is the spiritual home of Syrah but it most certainly is a small AOC of Hermitage revered as a place where some of the best wines from this varietal are made. 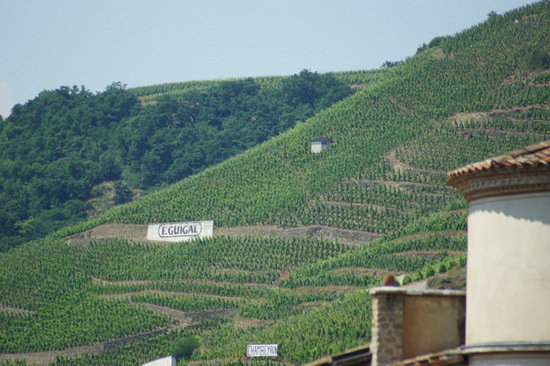 Tucked into the heart of the larger region of Crozes Hermitage, the tiny town of Tain L’Hermitage is dominated by the terraced vines basking in the warmth of the afternoon sun. The famous La Chapelle perched atop the hill bearing the name of Chapoutier stands vigil over the 345 acres where red wine of impeccable quality is produced. Very little white wine is made here but the law permits up to 15% Marsanne and Roussanne to be blended with the Syrah so there are some wines that utilize 100% Marsanne to make a very special white Hermitage. For lovers of chocolate, this petite village holds a special treat. Valrhona’s chocolate is prized by chefs and chocoholics alike for its richness and reasonable price. The boutique is home to a seemingly endless variety of sweet treats and shoppers often leave with bags full of the delicacies to tease and delight their palates. Who could ask for more? A town with some of the best wines in the world and chocolate to die for. Tain L’Hermitage is worth a visit no matter how short. Moving upstream past the largest Rhône region of St. Joseph on the western bank, the land has morphed from rolling hills to steeper embankments. Nearing Vienne the river is squeezed between slopes where the Côte-Rôtie region emerges and vines can be found on nearly 60 degree inclines. The “roasted slopes” are aptly named. Sunny and hot, the hills also provide the vines with some shelter from the Mistral winds. The river below has a cooling effect in the evenings to ensure that grapes are treated to unique growing conditions. No irrigation is permitted in the entire Rhône so the grapes must dig deep for their water through the granite and schist soils. This combination makes for wines that are deeply concentrated and rich with character. The winemakers try to further force the vines to compete for resources by planting their rows very close together. Unlike what may be observed in most of the new world, the vines are often spaced so closed together it must make harvest more difficult. The proximity of grapes to each other also ensures that hand picking is the only practical way to manage the harvest. Just outside Vienne are some of the great white wine areas of the Rhône Valley. But this place is somewhat unique for white varietals. 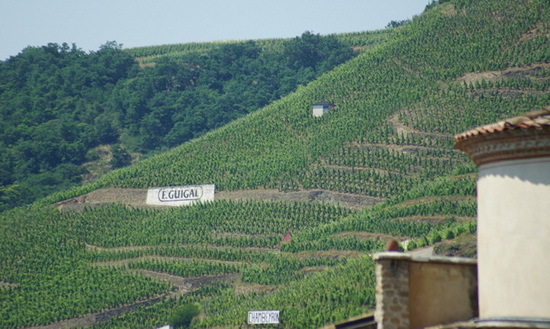 Viognier is the principal grape of Condrieu and the most famous AOC, and perhaps smallest, which makes a 100% Viognier wine is Chateau Grillet. The perfect harmony of apricots and honey emerge from these great wines and given its natural surroundings, it isn’t surprising that a cool glass of Viognier finds itself at home on a sun-soaked patio anywhere. The area around Vienne defines the northern Rhône, but further upstream the treasures of Burgundy await, beyond what many consider the food capital of France; Lyon. Perhaps Lyon could be considered as the southern gateway to the Mâconnais region of Burgundy. It is a large city dotted with cafes, shops and a wide variety of entertainment venues but for foodies the star attraction may be Les Halles de Lyon (http://www.halles-de-lyon-paulbocuse.com). Named in honor of Lyon’s most famous chef, Paul Bocuse, this indoor market is a mecca for those seeking Michelin starred quality ingredients, food and wine. With 50 different merchants under one roof, it’s hard to imagine a better way to discover most of the delicacies of France. Wine merchants carry an exceptional selection and one shop is dedicated solely to Champagne. Pastry and sweet shops display mouth-watering selections that absolutely cannot be resisted. For Monsieur Bocuse and home chefs alike, there are fruits, vegetables and fresh meats galore to forge into either hearty country cooking or haute cuisine. It’s easy to identify a poulet de Bresse at a poultry shop. With a reputation as the best tasting chicken in the world and a price to match (it has its own AOC designation), any misidentification would be a costly mistake so the custom is to leave the tail and head intact. Bearing the red, white and blue colors of the French flag the “Queen of poultry” is easily identified as genuine. Leaving Lyon the cruise departs the Rhône and enters the Saône River headed towards Burgundy. Along the way a gastronomic landmark, L’Auberge du Pont de Collonges (Paul Bocuse’s restaurant), can be seen about 4 kilometers north of the city on the western banks of the Saône. Slightly beyond the home of nouvelle cuisine lies Pouilly-Fuissé , the most famous vines of the Burgundian south. The Mâconnais is the heart of French Chardonnay value and has a warmer climate than its rival Chablis in the north. This climatic difference is reflected in a more rounded and softer version of wine than the crisp minerality of Chablis. Of course, the soils are vastly different and that clearly accounts for Chablis’ distinctive flinty profile. At Macon, the next port of call, there is an opportunity for tasting at a historic castle nearby. Chateau de Pierreclos (http://www.chateaudepierreclos.com) is an 800-year-old castle where the tasting room is buried deep beneath the stone walls of this fortress in its cavernous barrel room. The Chateau owns 8 hectares of Chardonnay plantings and in 2013 made the shift to a fully organic producer. Their attention to detail expresses itself clearly in the wines they make and these efforts were recognized two years in a row at the Concours Agricole de Paris where they were awarded gold medals. The final leg of the voyage terminates in one of the nicest towns in France and the home of an annual wine event that all oenophiles will recognize. The town of Beaune lies in the center of the Côtes de Beaune and some of the top villages are on its doorstep. Small cobblestone streets radiating from the Hospices de Beaune in the center of town are lined with patisseries, boulangeries, expansive wine shops and cafés where small plates and chilled Chardonnay abound. Each year, on the third Sunday of November, the nectar from the 150 acres of vines owned by the Hospices are put under the hammer. The auction of red and white Grand and Premier Crus wines in barrel help generate the funds to keep the ancient hospital museum thriving, but also sets the price expectations for the respective vintages of Burgundy. Just minutes south of the heart of Beaune, along the Route du Grands Crus, is the village of Pommard and its neighbours Meursault, Puligny-Montrachet and Chassange-Montrachet. A short bicycle ride north lands you in Sauvigny-les-Beaune and Aloxe Corton. This is a fabulous home base to explore and taste some of the finest French wines for lovers of Pinot Noir and Chardonnay. Not far north and just outside Nuits-Saint-Georges lie Domaine Romanee Conti, the tiniest of unassuming plots of land, cradling perhaps the most expensive Pinot Noir wines in the world. No free tasting here but it is possible to feel like wine royalty if you wish, by staying at the Abbaye de la Bussière (http://www.abbayedelabussiere.fr). This Relais & Chateau property is a 12th century Abby transformed in 2005 into a modern-day luxury lodge by a British couple, Clive and Tanith Cummings. Even if for only two nights, it is well worth buying the 1,000 Euro all-inclusive package (standard room). This rate allows the full experience of the grounds, accommodations and Michelin-starred restaurant with all the best of Burgundian wineries at hand. The cruise itself terminates in Chalone-sur-Saône after which the tour proceeds, by coach, ending in Dijon for the fast train to Paris. After a few days in the City of Lights, it’s homeward bound and another trip of a lifetime simply creates a lust to return and spend more time imbibing and enjoying the French countryside. A Guigal Côtes Rotie, Brun et Blond, sold for about $40 compared with a Canadian domestic price of about $70. David Skinner has been a long-time aficionado of all things related to wine and food. A passion that led him to the Algonquin College Sommelier Program where he was honoured with the Sommelier Award of Excellence upon graduation. Afterwards he attended master classes at London’s prestigious Wine and Spirit Education Trust (WSET) to build a stronger appreciation for the grape. However, becoming a certified sommelier was just the beginning of a search for a stronger understanding of what the wine and food world has to offer. Searching for great wine experiences, he went to the University of Californian at Davis (UC Davis) to study to become a certified California wine judge. That experience in the heart of Napa and Sonoma bred a hunger for wine-related travel that continues today. Travelling the world in search of great wine experiences gives David the opportunity to share his favorite stories of the vine on NatalieMacLean as well as in Outdoor Magazine. Note: Photos by David Skinner. 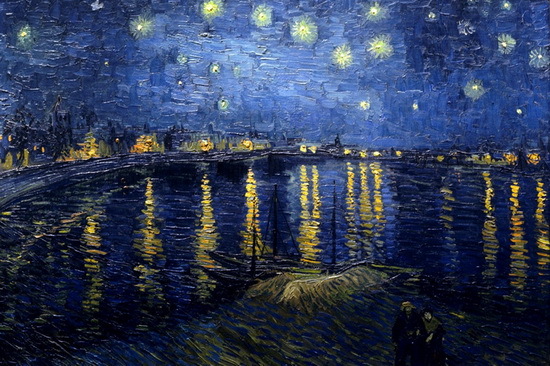 Starry Night by Van Gough (http://www.deshow.net), Lavender Fields (http://www.123rf.com) and Courtesy of Paul Bocuse Restaurant.